HOLLY SPRINGS N.C. -- A young dancer at the Holly Springs School of Dance surprised everyone at her dance school and thousands of people online by deciding to show up to a princess-themed dance practice dressed as a hot dog. 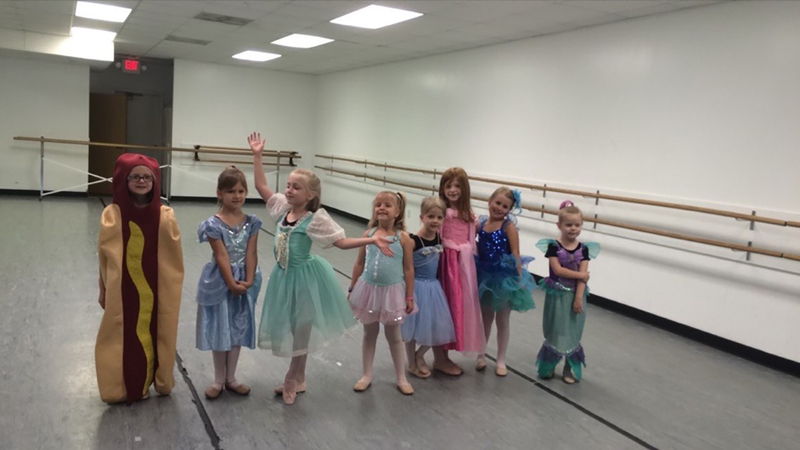 "For the last week of dance classes, our instructors invited their younger students to come to class dressed as a princess," Nikki Bird with the Holly Springs School of Dance said. "One particular student wasn't feeling like a princess so she came dressed as a hot dog!" she said. "The instructor posted a pic on Twitter celebrating her originality and it quickly went viral." The dancer's name is Ainsley and she's 6 years old. Her father, Brandon Turner said they had princess costumes at home but Ainsley purposefully didn't want to wear one. "She just said she wanted to wear it because this is my favorite costume," Turner said. "She wore the hot dog costume because she doesn't care what people think." Turner said Ainsley has no idea her photo is going viral and that her dance instructors should be receiving just as much praise for accepting her individuality and asking their students to do the same. "The hero is the school and these teachers who quickly said you're part of the team," he said. "Everyone smiled and chuckle it was great." The photos have inspired the hashtag "#HotdogPrincess" and it even took off into a Twitter "moment." She even opened up the show for her school's spring recital at Fletcher Hall in Raleigh Friday night.